The poor hens, every day they race out from their coop straight into the fallen sky....well that's how it seems with the endless rain. Thankfully, we do have an indoor area for them, but they love nothing more than rooting around the garden and scratching at the edge of the pond. 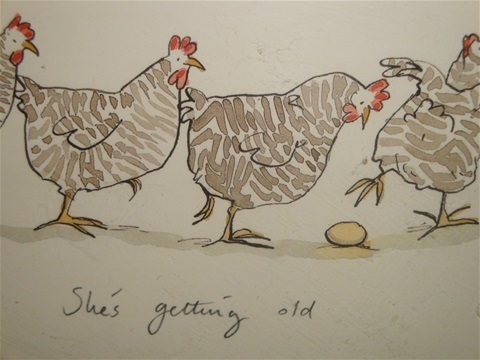 Over on the 'Small Tales' page, I've started a story from the hen’s point of view, of life at our home for waifs and strays. Her name is Sandwich! If you look at the picture, that's exactly what she's like.....trying to protect her egg to the very last or trying to squash it so no-one else can have it. She is such a character, they all are and they make wonderful companions. Today, I would just like to tell you about a very funny thing that happened. A neighbour stopped to talk to me and it was quite obvious she had something delightful to say. 'I couldn't believe my ears,' she began, and covered her cheeks with her hands, 'after all the years I've known him (my dear unassuming husband) he's never really spoken to me, so you can imagine my surprise,' her eyes widened and her face reddened. Before I move on, I had better inform you, that my dear, unassuming husband is a quiet man and the kindest person I have ever met. He is also very clever. 'What surprise?' I asked curiously. 'I was the other side of the hedge,' she continued, 'when I heard him call out to me,' she put her hand over her mouth and shook her head. 'What did he say?' I was not quite sure where this conversation was going. 'And?' I said, trying not to laugh. It’s my guess that my dear, unassuming husband was more embarrassed than my neighbour.